How do people learn? Research has found that it is our learning process, not our intelligence, that is the most important factor in determining our abilities -- making it vitally important to examine how we teach our students. So we must ask: how are we most effective at learning and retaining information? Is it when we are hearing, seeing, doing, creating, or some combination of the above? Recently, multi-disciplinary learning has become the trend in education, allowing students to make connections between seemingly disparate subjects. Kinesthetic learning takes this model to the next level by connecting the different ways in which we learn, and this process enables a more effective understanding and retention of information. In kinesthetic learning, movement and action replace more passive forms of learning, such as listening to a lecture. Everybody has probably experienced the effectiveness of this style of learning. No matter how many years it has been since you learned, most people can still ride a bike and swim across a pool. I am able to play piano pieces that I once knew, and I remember the moves to dances I performed when I hear the music. Yet I can no longer recite the capitols of all the states or the elements in the periodic table -- all information that I had memorized. No matter how much we memorize, recite, and study, our muscle memory seems to trump our brains alone. We learn best when we combine mind and body. So let's use our bodies to their fullest advantage and bring kinesthetic learning into our classrooms. Kinesthetic learning is founded on creativity, which makes math a natural pairing. There is a widespread misconception that STEM fields stifle creativity. But math also requires creativity and a willingness to approach a problem from multiple angles. In fact, STEM fields are about creative problem solving, not rote memorization. Certainly, math requires rigor and discipline to master. But so do dance, sports, or writing a paper. Because movement allows a student an alternative approach to the information, it can help put students in the receptive state required for learning. This breaching of mental barriers is especially significant for young women, who are more likely to self-limit their abilities because of the social stigma associated with mathematics and STEM fields. STEM is increasingly shaping our future, and kinesthetic learning can help encourage students to pursue STEM. 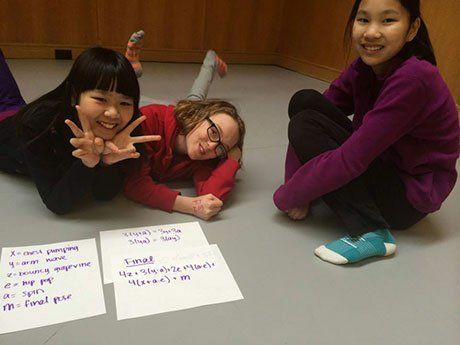 Using kinesthetic learning, girls are able to learn math in an environment when their mental barriers are not up. For example, algebra can be introduced through choreography. Girls can create a simple dance of three twirls followed by a jump, and will write it down as: "3x+y where x = twirl, y = jump." Through dancing, girls realize that 3(x+y) = 3x + y + 2y. Before they can say, "I can't do algebra," they already have. This begins the positive feedback loop of girls believing in themselves, and their confidence stems from knowing that they have the ability to succeed. We believe that students shouldn't know the answer to questions before they are asked, and we deliberately give them hard questions that they have to solve together in teams. Realizing that they are up to the challenge creates students who are more curious and more motivated. Throughout the program, girls began volunteering to lead solving problems on the board, and teachers reported that the girls began to raise their hands in classes. Team learning and cheering each other on is a large part of the supportive environment we seek to create. An important part of the way we teach is by encouraging each girl to be who she wants to be, without regard for previously conceived notions of who she is or what is cool. By showing students that they can succeed in a subject they were struggling with, kinesthetic learning is able to transcend the boundaries of what kids think they like. Having the mentors as women pursuing STEM fields provides the younger generation with role models. We can combine action and intellect to revolutionize learning. Our education system should be a beacon of creativity that encourages curiosity. Let's not fall behind, but instead leap forward with education that allows kids to confidently throw both their minds and bodies into learning. What are your experiences with kinesthetic learning? Please tell us about it in the comments section.